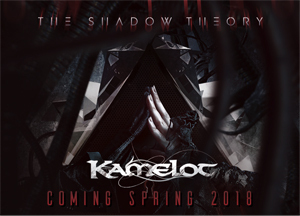 The rumors are true: KAMELOT are set to release a brand new masterpiece in 2018 and now the band has unveiled the album's title: THE SHADOW THEORY! The Shadow Theory is here! Coming this Spring on Napalm Records! The new album features all the signature elements of KAMELOT and also sees the band step out to add new and industrial elements along while combining amazing emotions that harken to the band's earlier days. KAMELOT's epic music is chock full of symbolism relating to how the band feels about the world and the current state of civilization. More news and details regarding The Shadow Theory - including album artwork - will be made available soon! Following the release of The Shadow Theory, KAMELOT will embarque on a massive World Tour, starting in North America during April/May 2018 followed by European shows in Summer 2018 in support of The Shadow Theory. The band will return to Europe in September/October 2018 for their biggest headliner tour to date. Today the very first show of the upcoming The Shadow Tour has been announced! Grab your tickets now, as pre-sales are up and running! "TILBURG! KAMELOT returns to the Poppodium 013 to support their new album and to commemorate their very special relationship with the Dutch fans! There have been 10+ SOLD OUT KAMELOT concerts there over the past few years. To thank you for your support we are very pleased to announce we will be shooting this show as part of the band's long awaited DVD! Don't miss this very special event!!" To get in the right KAMELOT mood make sure to take a look at the latest released music video for the track "Under Grey Skies", featuring DELAIN's Charlotte Wessels on KNAC.COM HERE.